Christopher Fox was born in York in 1955 and is today regarded as one of England's best contemporary musicians. Apart from composition, Fox is also a renowned teacher and writer on new music. In 1981 he won the composition prize of the Performing Rights Society of Great Britain and in 1984 was awarded the degree of D. Phil. in composition from York University. Between 1984 and 1994, he was a member of the Darmstadt New Music Summer School in Germany and in 1987 was in West Berlin as a guest of the DAAD Berlin Artists Programme. He is at present Professor in Composition at Huddersfield University. 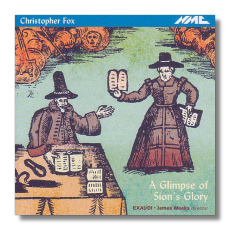 This disc is made up of four choral pieces and one for organ solo, "Open the Gate" and "A Glimpse of Sion's Glory" are two very accessible pieces portraying liberty and liberation in the former, while the latter deals with the conflict of ideals rife in 17th century England. "The Missouri Harmony" is the only instrumental piece, and takes its title from a 19th century document describing the musical practice of the Shakers, the American religious sect where worship music was vital as an expression of spiritual ecstasy. During their services, each member would follow his own musical path based on the original melody so that the overall effect was that of an inspired cacophony of voices built around the same tune. In his composition, Fox's attempt to create the equivalent of this process is totally successful. This piece is in fact the most uplifting of the whole programme. "Rendered Account", set to a poem by Ian Duling is concerned with walls, linking Belshazzar's wall to those that are a symbol of tyranny across the ages up to this day. "American Choruses" is not based on the traditional aspects of music but on models of American experimentalism, particularly Ives and Cage. Set to texts by Allen Ginsberg, the score indicates a network of cues and relative note lengths through which the singers must find a way while passing the text to one another. The resulting music is that of genuine spontaneity, with an intimate frailty which only this kind of indeterminate rotation can conjure up. The Exaudi's powerful performances under James Weeks together with excellent sound and notes give this innovative disc that tinge of real substance.